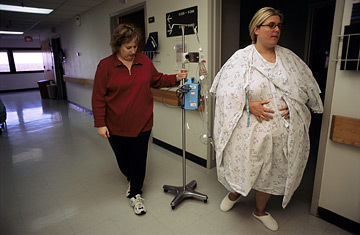 Linda Hay, weighing 314 pounds, prepares for gastric bypass surgery. Whether one regards bariatric surgery  last-resort weight-loss operations such as gastric bypass and stomach stapling  as an essential treatment for obesity or as a failure of the fat person's will, the fact is, it works. Studies have shown that after surgery, patients often lose 50% or more of their excess weight  and keep it off  and symptoms of obesity-related conditions like diabetes, high blood pressure, high cholesterol and sleep apnea are improved or eliminated altogether. Now, two new studies in the New England Journal of Medicine (NEJM) show another long-term benefit: a lower risk of death. The larger of the two studies  the largest of its kind  led by researchers at the University of Utah School of Medicine, looked specifically at gastric bypass surgery, also known as Roux-en-Y gastric bypass, which accounts for 80% of all bariatric surgeries in the U.S. The operation involves creating a small walnut-size pouch at the top of the stomach, which is then stapled off and connected to the small intestine lower down than usual; the result is that patients can eat only an ounce of food at a time, and the food bypasses most of the stomach and the top part of the intestine, limiting the number of calories the body absorbs. In the Utah study, researchers compiled data on 15,850 severely obese people, half of whom had undergone gastric bypass surgery between 1984 and 2002, and half who were from the general population and had had no surgical intervention for obesity. Overall, researchers found, the surgery patients were 40% less likely to die from any cause during a mean 7 years of follow-up, compared with the obese controls. What's more, the mortality rate attributable to obesity-related disease was 52% lower on the whole in the surgery group: after gastric bypass, patients were 92% less likely to die from diabetes, 59% less likely to die from coronary artery disease, and 60% less likely to be killed by cancer. Results like these have got some doctors intrigued enough to start thinking about bariatric surgery as a treatment for conditions other than obesity especially diabetes. A growing body of research suggests that the surgery may reverse the disease, a potential solution that could help some 20 million American diabetics. Though the current NEJM study did not specifically study the impact of bariatric surgery on diabetes, it did reveal a 92% reduced risk of death from the disease in surgery patients findings that support what has been emerging in other experiments. "In more than 80% of patients who are severely obese and have diabetes and then have gastric bypass surgery, the diabetes is cured," says Ted Adams, professor of cardiovascular genetics at the University of Utah School of Medicine and lead author of the new study. "The interesting thing is that the resolution of diabetes happens within a few weeks following surgery, long before patients have lost their weight." Like some other researchers in the field, Adams believes that the surgery triggers other biological mechanisms, separate from weight loss  perhaps an interruption of a crucial biochemical pathway or a change in the release of certain hormones in the stomach or small intestine  that may have powerful effects on diabetes. "The gastric-bypass patient is really providing a source of intriguing research related to all kinds of disease treatment as well as weight gain and weight loss," says Adams. The second study, led by researchers at Gothenburg University in Sweden, involved 4,047 obese volunteers, 2,010 who underwent some form of bariatric surgery and 2,037 who received conventional obesity treatment, including lifestyle intervention, behavior modification or no treatment at all. Ten years after surgery, researchers report, the bariatric surgery patients had lost more weight and had a 24% lower risk of death than the comparison group. Though the overall number of subjects in this study is much smaller than the first, the results confirm general benefits of bariatric surgery, and gastric bypass in particular: after 10 years, bypass patients had maintained a 25% weight loss, compared to a 16% loss in patients who had stomach stapling, and 14% in those who underwent a banding procedure. In both studies, surgery patients had an overall lowered risk of death, but an interesting finding in the Utah study shows that these patients were 58% more likely to die from other causes, such as suicide and accidents. The authors speculate that as people lose weight and become more active, they also become more prone to accidents, which may up their risk of death. Surgery patients may also have pre-existing psychological problems  a history of abuse, perhaps  that can't be resolved by losing weight. "There have been some studies reporting that following bariatric surgery, some individuals may be more prone to chemical dependency, such as increased alcohol use," says Adams. "There's some speculation that certain addictive behaviors that are in place before the surgery  with food, for example  are transferred to alcohol or another addictive behavior." "Hopefully this research will stimulate additional evaluation of what the optimal approach is for evaluating candidates for this surgery," says Adams. "I think we should never lose track of the importance of individual evaluation of benefits and risks." Last year, an estimated 177,600 patients underwent bariatric surgery, a figure that's likely to grow as Americans get fatter and fatter. Though modern surgery techniques have become more sophisticated, less invasive and safer than in the past, the bariatric procedure still carries all the risks of any other operation. Patients have a .5% to 1% chance of death. The risk of gallstones goes up. Sometimes a second surgery is necessary. And all patients must be careful to make up for vitamin and mineral deficiencies. The surgery isn't for everyone; current guidelines recommend it as a last resort, only for the morbidly obese who have a BMI of 40 and higher, or for the obese with a BMI of 35 and higher plus a serious weight-related illness like diabetes or hypertension.